Lydia is the seller of purple in the bible and is also related to women of business. 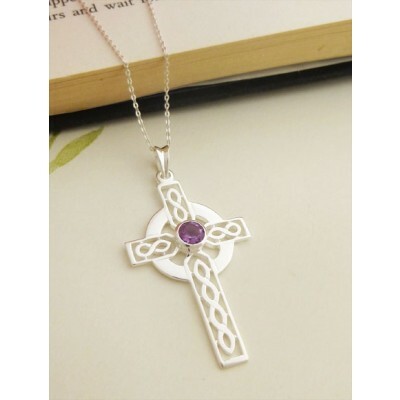 The light purple of the Lydia silver celtic cross is a great reflection of the name. 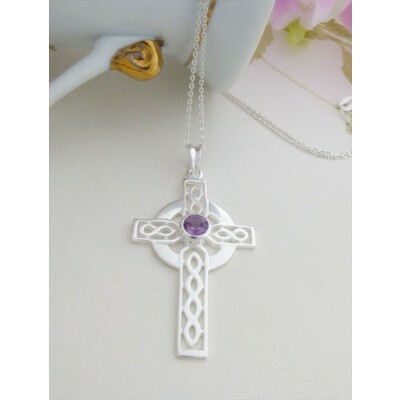 A large sterling silver cross in a simple celtic design, the Lydia features a simple round amaethyst stone that is multi faceted to reflect the light. 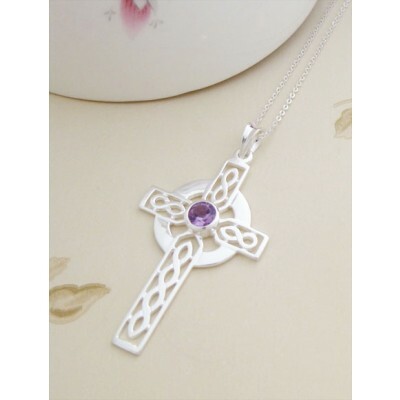 The cross features four lengths with an intricate celtic internal design and a circle in sterling silver surrounding the purple Amaethyst stone. A gorgeous cross, perfect for lovers of celtic silver necklaces and for those seeking a ladies silver cross necklace. The Lydia sterling silver cross measures 42mm in length and 25mm in width. This silver celtic cross necklace is UK hallmarked 925 sterling silver. The Lydia sterling silver cross measures 42mm in length and 25mm in width. This silver celtic cross necklace is UK hallmarked 925 sterling silver. Featuring a beautiful round amethyst stone and the chain is available in three different lengths.